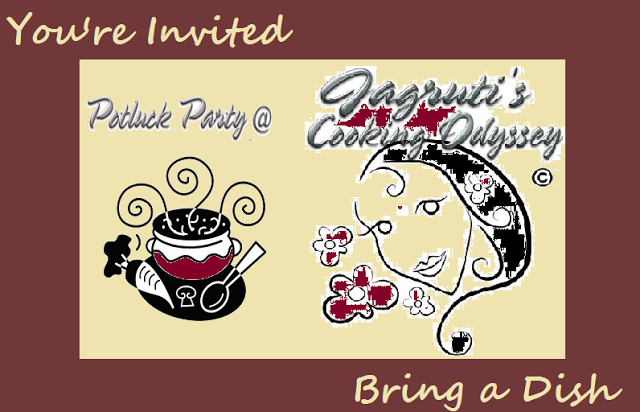 We had our first Potluck Party, Cyber Style on 10th of April here on JCO ! Had lots of lovely and delicious food and drinks and fun with our fellow food bloggers who already linked their dishes here. Obviously, we all live in different parts of the world, so there is no chance that we can taste their food, but we decided that if we prepare each others dish again in our own kitchen, we can taste and eat their dishes too ! I was paired with one of our guests Manjula of Desi Fiesta. She brought Raw Mango Rice to our party, pictures were so tempting and rice looked delicious. I prepared this rice the next day and followed exactly the same recipe. We never had Raw Mango Rice before so I must say I am glad I made because my family loved it so much..I will prepare again and again Manjula, Thank you so much for sharing this dish with us!! Cook rice in boiling water such a way that every grain is seperated. Let the rice cool compeletley. Heat oil in a heavy based pan, add mustard seeds and hing. When they spulutter add peanuts, channa daal. After one or two mintes add urad daal, chillies and curry leaves. When they are slightly brown add grated mango, haldi and salt. Cook mixture for 2-3 minutes, now add cooked rice. Mix everything gently and turn of the heat. Garnish rice with fresh coriander and serve with raita, salad and papad. Linking this dish to Potluck Party, Cyber Style . Linky tool below . Javelin Warriors Made with love Mondays. Delicious and tangy looking rice. Glad to know you had a blast at the party. yum yum mouth watering raw mango rice. This mango rice sounds very tasty! Love the color and presentation as well... Thanks so much for sharing!